A happy dog has a relaxed facial expression. Dogs can't speak to us in words, but canine posture is amazingly consistent from one dog to the next. Those non-verbal cues are as eloquent as any spoken language, and learning to understand them will help you to interact with your dog and other dogs in more meaningful ways. Look at the whole dog first, not merely at his tail or his teeth. Though those parts of the dog's body often convey important information, a wagging tail does not automatically mean friendliness. Bared teeth can often be a doggie smile or a sign of fear. Body position in conjunction with other signs gives a more accurate picture. Notice whether the dog's body looks normal in size and position, with head and feet held in a relaxed, natural posture. That is a good sign that the dog is relaxed. Aggressive dogs often try to make themselves look larger, while a submissive or frightened dog will try to get as small as possible. Key in on the more obvious large signs next. Look at the dog's tail, mouth, eyes and along his back. Learn to interpret the different tail positions. If everything else in your dog's posture is relatively normal, the tail position and the degree of wagging can offer additional hints of his feelings. A quickly wagging tail that extends to the whole rear area usually indicates happiness or excitement. A tucked tail or even a low wagging tail -- especially with flattened ears and a crouching posture -- means your pup is frightened or being submissive. An upright or stiff tail position on a similarly rigid, straight or forward-thrusting body may mean challenge or suspicion. Check the mouth to see if your dog is panting softly and smiling, which is a sign he is relaxed. If you see bared teeth accompanied by a wrinkled nose, growling or barking and a forward thrust of the body and ears, look out – that is assertive aggression. Growling and bared fangs with a backward body thrust and lowered ears is still aggression, but it is defensive. 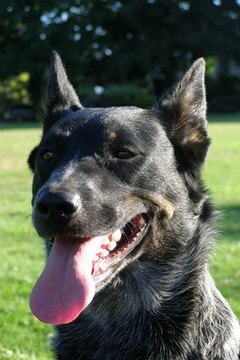 If the tongue is out and the mouth is open, the dog is probably feeling playful, but if the mouth is closed over a protruding tongue and the dog appears to sink down upon approach, he is likely fearful and being submissive. Look at the dog's eyes. A hard stare is not a good sign. Dogs rarely do that unless they are being aggressive or dominant. If the stare includes a narrowing of the eyes, the dog may also be anxious. Wide open and staring eyes with a hard focus could mean predatory inclinations. You should definitely know that look if you have cats, smaller dogs or children in the household. Narrowed eyes along with a low body posture and lowered ears or the same posture with very wide eyes and the whites showing may mean submission or fear. Friendly eyes just look friendly – they are open and soft, but alert. Pay attention to the dog's back. In almost all situations where a dog is becoming dominant, aggressive, wary or defensive, his hackles – the fur along the spine, especially at the shoulders and hips – will rise. Calm dogs and submissive dogs do not do raise their fur in that way, since they want to appear normal or look smaller. Check to see if the ears are up, back, lowered or forward. All those positions mean different things when taken with other signs. Lowered ears can be an additional sign of fear or they can be part of a defensive stance, depending on the dog's body posture. 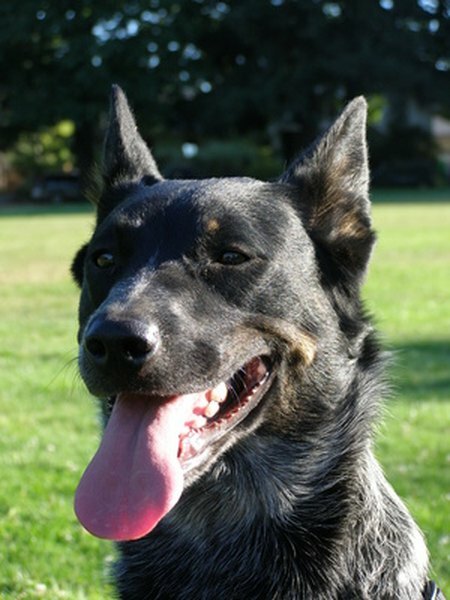 Alert ears can indicate aggression, but they can also mean curiosity or a playful attitude. Always keep the ears in mind, but rely on them only in conjunction with other signs. Notice the little things. Very frightened or submissive dogs may whimper and whine, dribble urine, pant or even sweat from their paws, which is noticeable as damp footprints. When exhibiting submission to other dogs, a frightened and subordinate dog may lick the mouth of a dominant dog. Study the interactions of dogs with people, dogs with dogs and dogs with other animals. Consult charts and try to notice patterns. The more you observe your dog's postures and behaviors, the better equipped you will be to handle the joys and the responsibilities of dog parenting. What Is Low-Phosphorus Dog Food? What Does a Bird Dog Mean?